Dyanne Davis, a writer friend of F.D. penned a romantic tale that received favorable responses from those in the know. And as such she has recently received an honor that I will not take from here, but I am wondering about the tales of my life. No matter I digress. Back to the mortal. 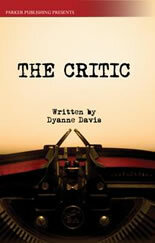 Dyanne Davis' romantic tale, The Critic, has been nominated for an RT award for Best AA book of the year. I'm told that whether she wins this award or not, that the nomination is still considered an honor. So in all my vampiric glory I offer my sincere and unsarcastic best wishes to Dyanne. Here here Dyanne. I hope you win.